220 goes for the running-in ride to Pondicherry.Click here to read more about this! We start the day with rains. So both of us had to wear our rain gears and luggage was covered with tarpaulin. It took almost half an hour to saddle up the luggage first then to wrap it up with the tarpaulin. This being the first time we took some time to cover it properly and secure it. We had a tea while we were packing it up. We moved at a slower pace due to the rains. But the views were getting better and better every kilometer we covered. Lots of traffic in this section and being on bikes, we were exposed to all the slush and muck that the trucks, buses and four wheelers had to throw on us. One rear tyre flap less car had thrown some muck on my bike and it left few spots that you can see in the pics. Those remained like that until the bikes were washed in next rains. The presence of Armed Forces was also increasing as we get closer to Kashmir. Rains subsided by the time we stopped for breakfast some 40 kms from Udhampur. At this stop I noticed a lot of Indian oil tankers. These tankers gave company to us till Leh. I even noticed one particular truck that did till Leh with our same pace. Hats off to those truckies! Now the roads started to worsen and the traffic started to increase. We were getting the feel of the mountains as the views were becoming fantastic. At one place I could see a snow capped mountain. I was so excited to see such a view in real life. We stopped there to have a good view of it though it was very very far away. At this place a police Inspector who was doing a routine check of the tourist vehicles commanded us to come nearby, sitting in his gypsy. He started asking us about the trip and our whereabouts. He wished us luck and asked what bikes we were riding. We said that we were on Pulsar 220 and Thunderbird, he was surprisingly asking us was that thin rear tyre, a RE bike. He was thinking that RE bikes had fat rear tyres! He also mentioned looking at my 220’s rear tyre that its not going to do Ladakh in that state. But in reality it did the entire circuit without a single puncture! My bikes tyres were around 10-12 k kms old. They held well throughout the trip. At this particular spot we saw a BRO board that read "Kashmir to Kanyakumari India is one" . We had to stop there with our TN plate bikes and click a pic. While we were doing so , an Army truck stopped by and parked begin that boar under the shade of the tree. The Army jawan courteously asked us to move the bikes aside so that the truck can be parked and asked us to park the bikes in front of the truck so that the bikes are in the shade from truck. They wanted us to have lunch with them as they were about to cook. But he explained them about our schedule and had to move on with just filling the bottles with water from the truck. This was our first experience with the Army in this trip and it made an impression. These guys are so hospitable! After sometime we entered the famous Jawahar Tunnel, 2.5 kms long tunnel that bridges Jammu to the Kashmir Valley. Listening to the roar of the motorcycles exhaust note when inside a tunnel is music to any biker’s ears. As soon as we exit out of the tunnel we were stunned by the beauty of the hills. It drastically changed as we entered Kashmir Valley. We stopped for few pictures at the customary titanic view point and moved on. Had lunch at one of the small dhabas en route. After many kms we were riding on plain lands, it was a surprise for me after all the hilly section. Nearing Srinagar the traffic got worse with traffic jams becoming common. Somehow managed to navigate through the traffic jams and reached Srinagar by evening. Managed to find a hotel with decent parking, unpacked our stuff from the bikes, freshened up and we headed to the market. 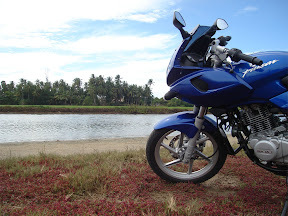 Vignesh had to tighten the rear tail lamps of his bike as a bolt securing it had loosened. Luckily there was a RE mechanic nearby. While fixing it we met a few guys who said they were from Odisha, were on hired bikes from Manali and are on the same circuit as us. These guys would come again later in our log. It was dark by the time we headed out side to the market, so we decided to go to Dal Lake the next morning before leaving to Kargil. Click here to read more about this! 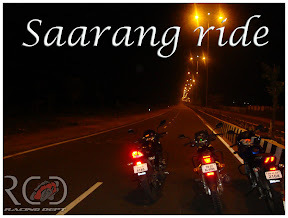 Ride to Thirupathi with fellow bikers. Click here to read more about this! 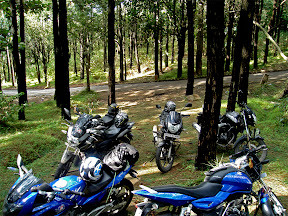 11 bikers,10 bikes,300kms,Happpy childern! !Click here to read more about this! Read the trip logs with pictures!!! 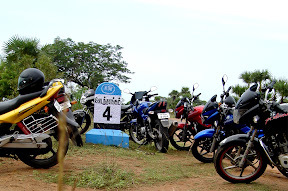 Sunday morning ride with our Biker buddies Racing Department to Vedanthangal.Click here to view the trip log and pics!